Nice review of Anapest: The Minicomic on UK cartoonist Sean Tiger’s Paper-Tiger Comix biog this week. This all-rhyming 12 pager combines three of my online Anapest strips with a longer story, “Chastity Blasé”, written by me and illustrated by Chad Essley. 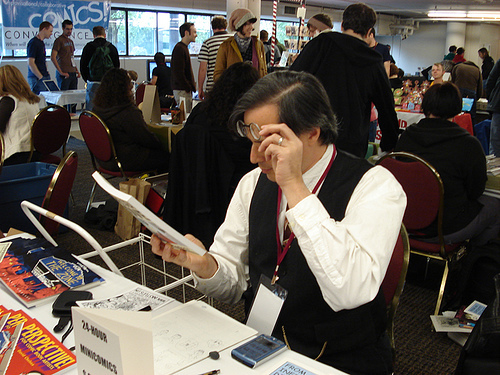 l will once more be appearing this coming weekend at Portland’s annual Stumptown Comics Fest. My new book, Extreme Perspective!, won’t be published until next year, but I’ll be showing preview pages from it, selling old books, taking snapshots with my Palm Pilot and bringing something new- reproductions of hand-drawn envelopes from the series Letters To Geoff (minus their original addresses and stamps), which you can mail to your friends! Me at last year's Stumptown. 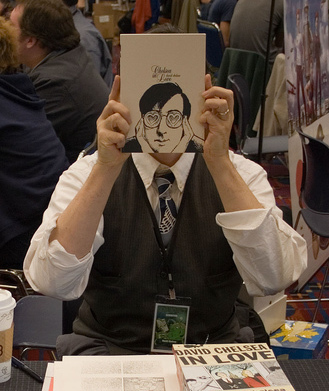 This weekend l will be making my only convention appearance of the year at Stumptown Comics Fest here in Portland. I wasn’t able to get any new material together in time, but l will have all my books for sale; l will also make myself available for perspective consults. I’ll be taking donations as well for the S. Clay Wilson Special Needs Trust– if anyone’s on the fence about contributing to this worthy cause, they can preview the original art for the 24 hour comic I drew, a copy of which comes with your donation (I just haven’t finished scanning the art yet).